Passage Series: Private collection, Auckland. Soul, Language as a Virus alludes to the migration of language and the Greek mythical idea of a soul being imprinted; actions recorded during a persons lifetime. After death, the souls were believed to be hung in the caves of Hades. 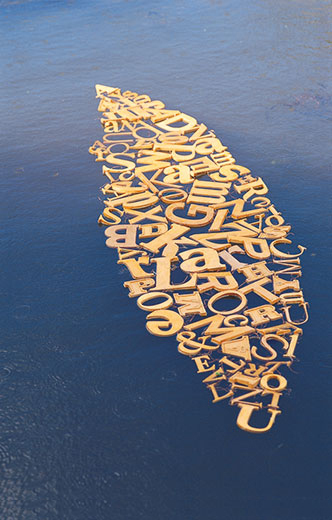 The work is assembled from a collection of recycled, fragile, wood letters. The delicately shaped letters, originally made for bronze sand-casting, were connected using fine copper wire. The letter A begins the work that is completed with the letter U. The work is owned by an Auckland Advertising Company. Waiheke Art Gallery invited Virginia to submit a self-portrait for photographic exhibition, titled So You Want To Know What I Really Look Like? Virginia stood behind Soul, Language as a Virus for the photo. Dimensions: Length 2000mm x Width 700mm x Depth 12mm. Materials: Salvaged sand-casting wood patterns and copper wire.